Malaysia’s Toyota distributor, UMW Toyota has just launched the new face-lifted Toyota Hilux which will now be offered in 5 variants. They are the Single Cab 2.5 M/T which will be sold for RM73,255, the Double Cab 2.5 STD M/T which is priced at RM83,700, the Double Cab 2.5G M/T at RM91,900, the Double Cab A/T at RM96,970 and the top of the range Double Cab 3.0G A/T at RM107,250. 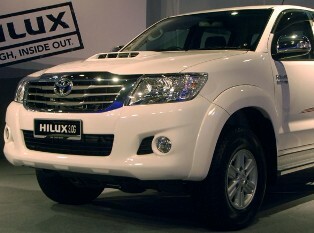 The new Hilux look was first seen recently at the Indonesia International Motor Show and it now comes with a new front end as well as the bumper and the headlights. The top of the range model comes with a bonnet air scoop while they have put the indicator lights on the side mirrors which if you get the top range model will allow you to electrically fold it in. They have also given the dashboard a new design with more contrasting scheme of colours. The double din audio system is now fitted into the 2.5G and the 3.0 model while you can also opt for the highly popular AVN (Audio-Video Navigation) DVD system that comes with a 6.1i inch colour screen as well as a reverse camera. There is no major change to the engine as this is the face-lift version and the 3.0 one comes with the Variable Nozzle Turbo diesel drivetrain.